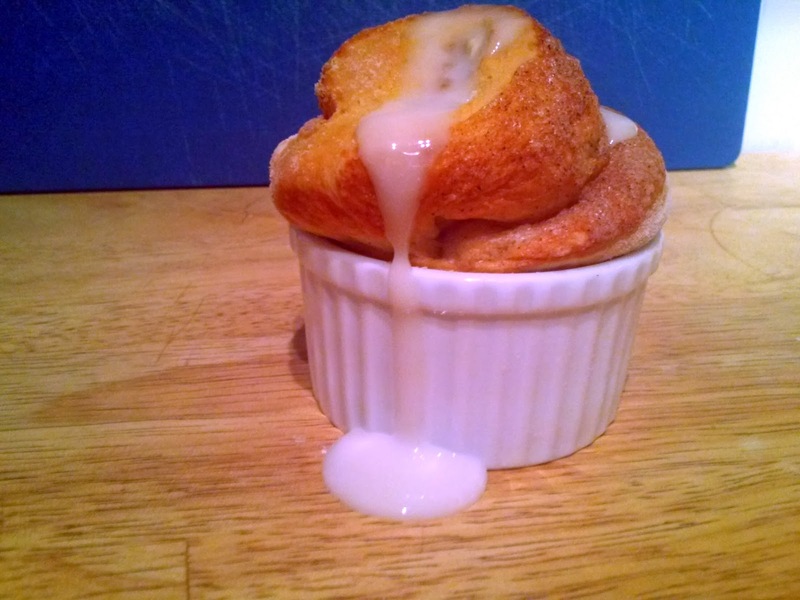 I love to cook, most people already knew that or assume it because I'm a Baker and this is "The Baker Blog" so I suppose it makes sense that I've decided to do some blogging on recipes I love instead of the usual rant filled snark everyone is used to. 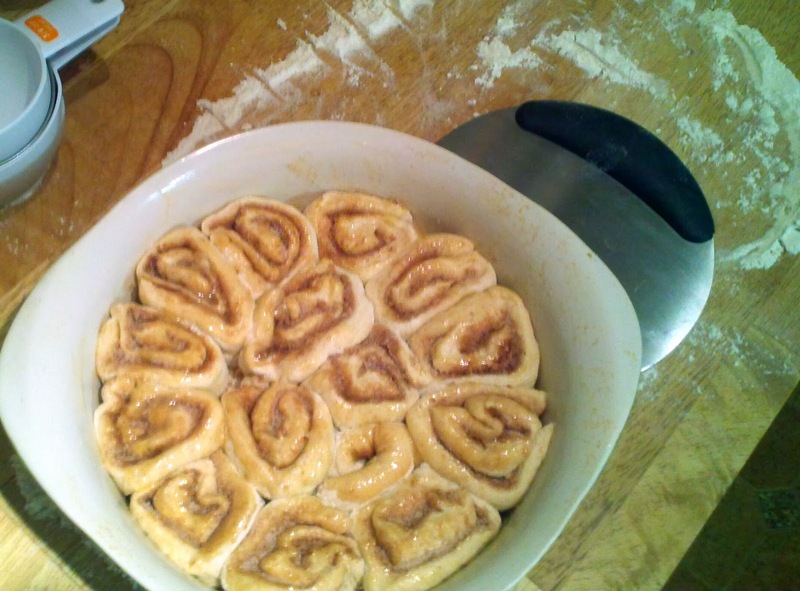 First up Easy Cinnamon Rolls. 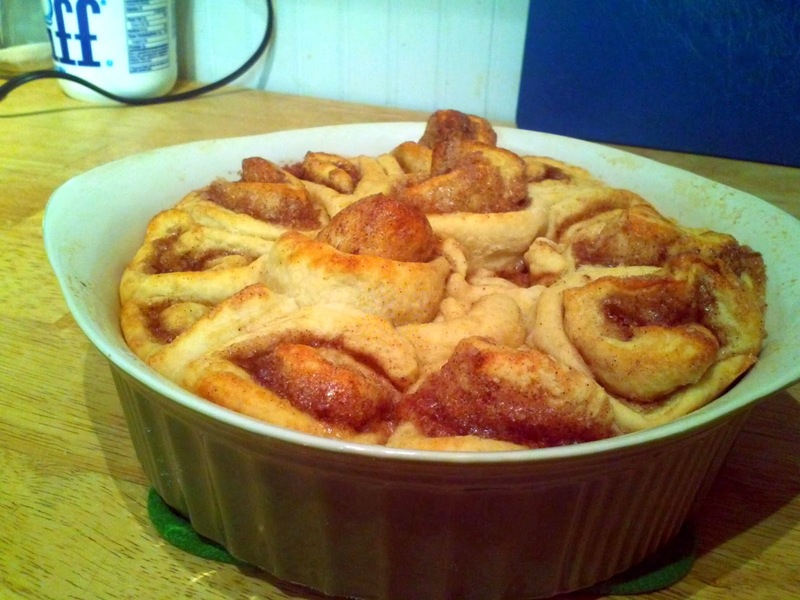 I found this recipe on one of my favorite food blogs, The Minimalist Baker . You need to check our this amazing collection of super yummy recipes. I only wish I could be half as creative not to mention the photos are amazing and always make me hungry. I've had to stop myself from licking my computer screen when I go to their page. *If you don't have Earth Balance don't worry. Use whatever vegan spread you have that says on the package that it's OK for cooking. I've also made this recipe using butter (unsalted) and it worked out fine. For yeast I'm very picky. I always use SAF Red Instant Yeast. I buy it from King Arthur Flour online and get about a year or so per pound. 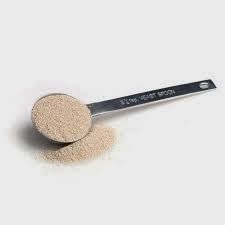 Yeast tip - NEVER store yeast in the refrigerator! Yeast doesn't like constant temp changes that you get inside the fridge because the door opens and closes frequently. If you purchase a small amount store it at room temp. For longer periods of time yeast should be stored in the freezer. Just pop it in an airtight container - I use a plastic one with a screw on lid, I put the yeast in the container open but still in it's original packaging zipped inside a plastic bag. When I need yeast I just grab it from the freezer (it does not need to warm to room temp if you're using SAF Red Instant) and use the amount directed in the recipe. 1 packet is approximately 2 1/4 tsp of yeast. And yes I'm such a baking geek that I purchased a special yeast spoon with the exact correct measurement for bread recipes. OK so here goes the pouring and mixing and baking part. Or the swearing, the banging, and the burning part. I have no clue if you can cook. 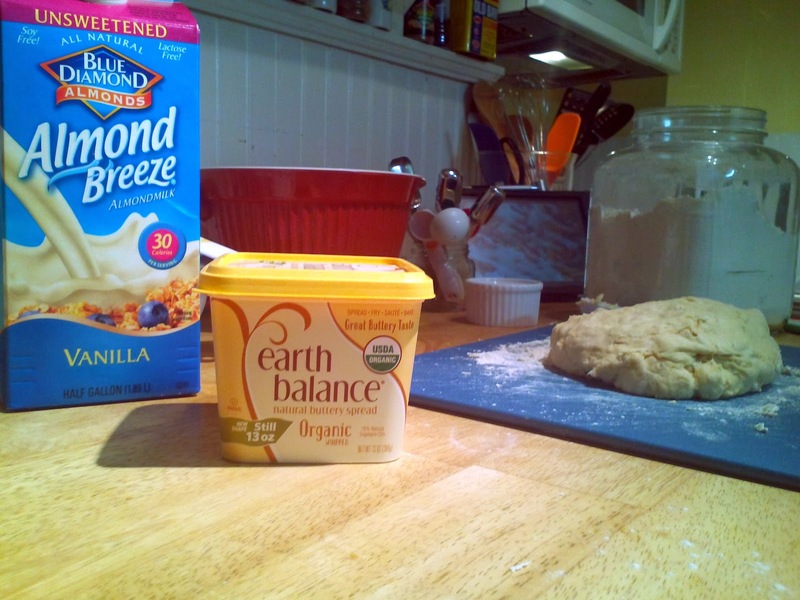 In a small sauce pan pour 1 cup of almond milk and add 3 tablespoons of Earth Balance. Place on low heat. Low heat is very important since the almond milk should NEVER (really NEVER NEVER) boil. You just want to melt the spread not scorch the milk. Once your almond milk and spread become one remove from heat and let cool to 110 degrees. 110 feels pretty close to warm bathwater - not hot bath water! 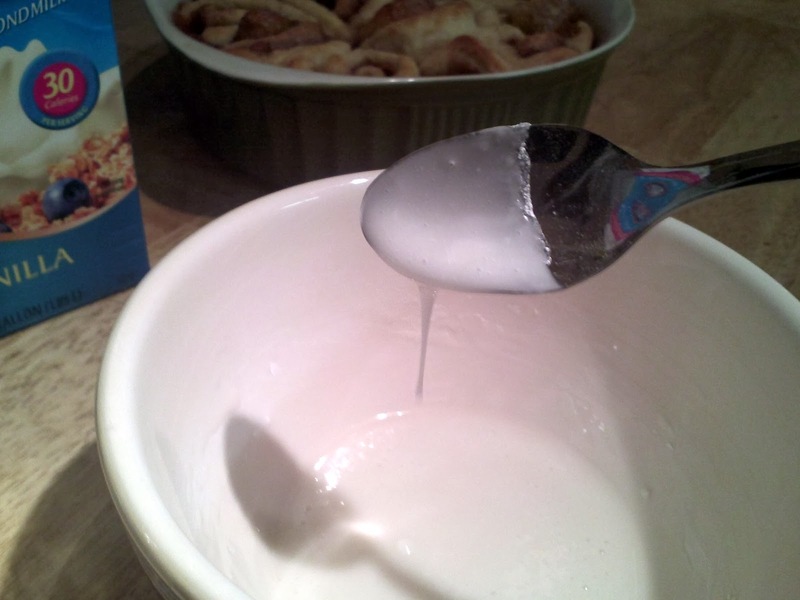 Pour your milk mixture into a large mixing bowl and add the yeast. If you're using SAF Red Instant you really don't have to wait for the yeast to become active though I normally do wait a few minutes while I start to measure out my other ingredients and too wash my sauce pan since I'm obsessive about a clean work area. If you use any other yeast not labeled instant or if you're not sure let it sit for 10 minutes. Use this time to walk in place to burn off a few calories so you can indulge in more than one cinnamon roll at the end. Once you've waited for the yeast to activate add 1 Tbsp of sugar and salt. Stir. Now you can start adding your King Arthur Flour (I keep referring to KAF hoping they'll read this blog and send me some free products. I'd really like the dough stirring doohicky they have and a covered pullman pan). Add the flour slowly, 1/2 a cup at a time. Stir after each 1/2 cup until completely moistened. When you can no longer stir in the flour because it's starting to be very stiff it's time to take the dough out of the mixing bowl and onto a floured surface. Don't worry if you didn't use all of the flour. Baking anything that rises, like bread or rolls, the amount of flour is always slightly different depending upon weather and temp. Today for instance I used just over 2 1/2 cups and my dough turned out fine. Once you've turned the dough out of the mixing bowl, scraping all the of the mix off the sides (a KAF bowl/dough scraper comes in handy here) place the bowl aside, you'll need it again. Knead your dough for about a minute. It doesn't need a lot of work so don't beat it to death, just be gentle with it. Once it's nice and smooth like a babies bottom (if you don't know how smooth a babies bottom is just pretend it's not like your bottom) place it aside while you lightly oil the mixing bowl. I use canola oil but it's perfectly fine to use vegetable oil or even good quality cooking spray made from canola oil. 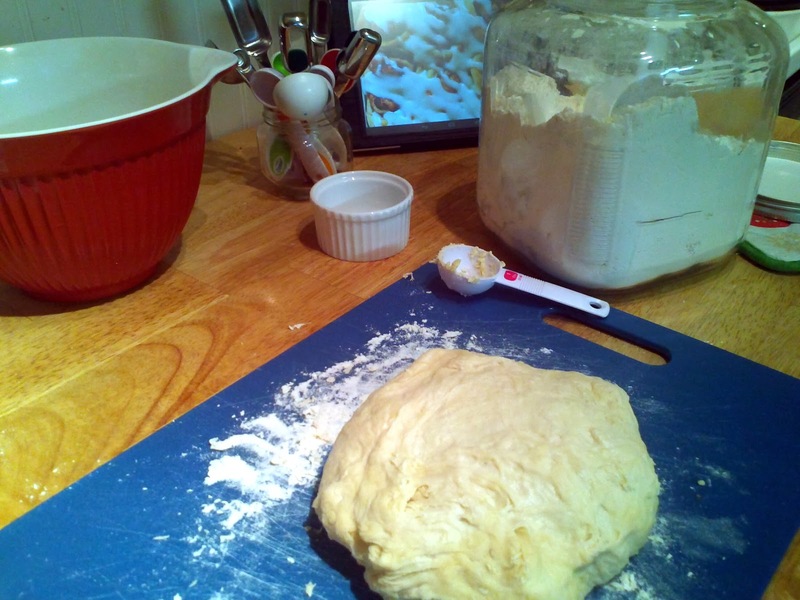 Place dough in bowl and cover with wax paper or plastic wrap and set a timer for 1 hour. Once the hour is up your dough should have doubled in size. During this hour you could clean under your sink or rearrange your cutlery drawer. Or even practice voodoo - it's really no ones business what you do during this hour. After one hour take the dough out of the mixing bowl and place back on a lightly floured surface. 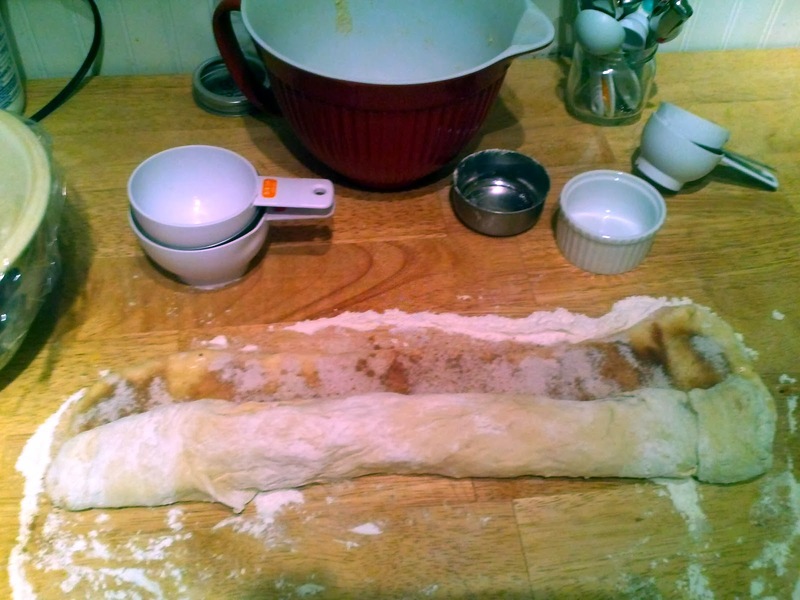 Using either your hands or a rolling pin roll out a thin (but not too thin, this is a cinnamon roll not french pastries) rectangle. I almost always use my hands since the dough is pretty easy to work with. This isn't a very good rectangle. It looks more like a Sasquatch foot print. 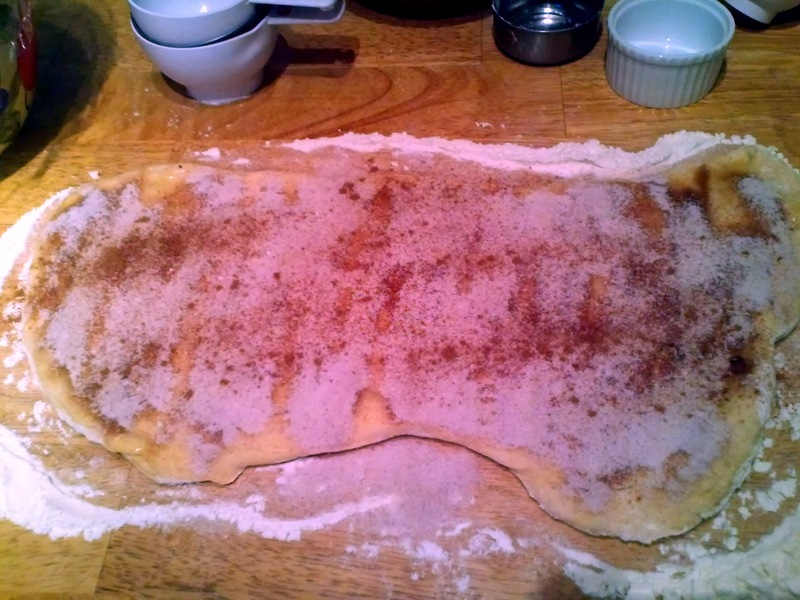 Brush your dough with 3 Tablespoons of Earth Balance (or butter if you went that route and I normally don't use the complete 3 tablespoons so you be the judge of how much you'll need) and sprinkle 1/4 cup sugar and the cinnamon. I normally add a few shakes of either apple pie spice or pumpkin pie spice for a little flavor zing. Plus I'm a rebel. 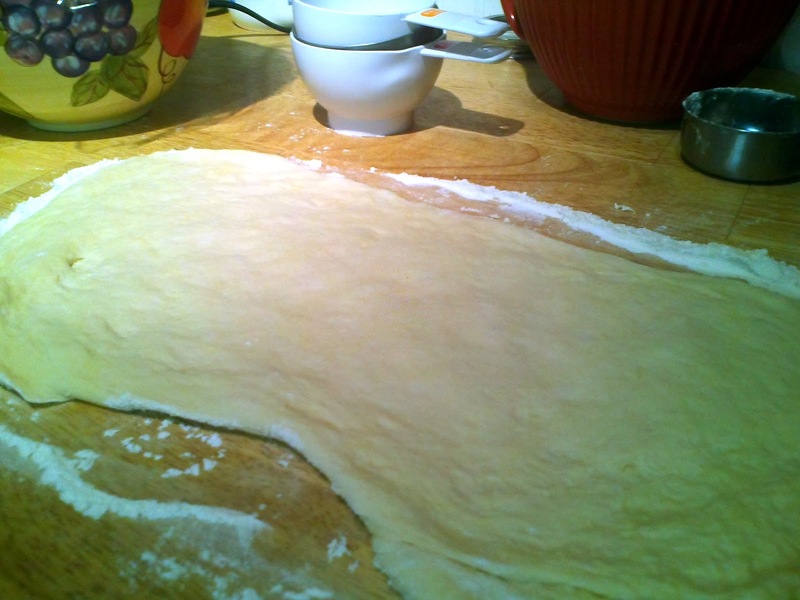 Once you've added the sugar mix to the top roll the dough rectangle away from you and once rolled make sure the seam is on the bottom. I don't roll overly tight - you're not trying to squish it but simply roll it. 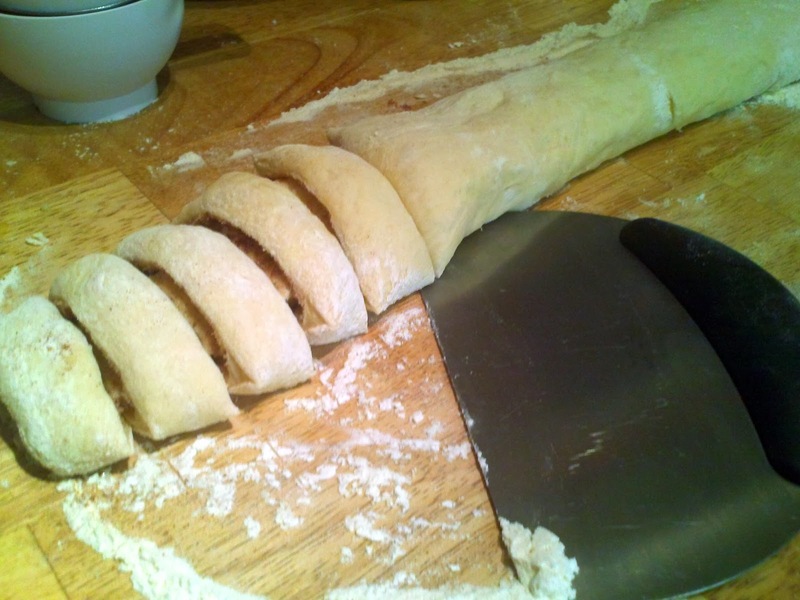 Then take a flat kitchen cutter/scraper or a sharp knife and cut the dough into approx. 2 inch sections. Place cut dough into a well greased 8x8 baking dish (round or square - your choice) and let them sit while the oven preheats to 350 degrees. While you're waiting clean up the rest of your mess. Bake for 25-30 minutes or until golden brown. Cool before serving. Ahhh Golden Dough of Sweetness! 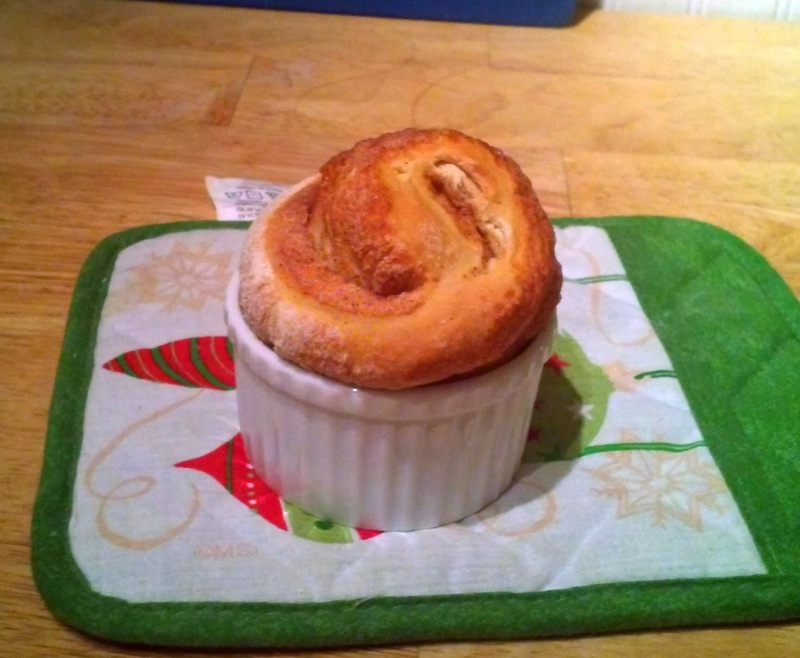 I had one piece of dough left that wouldn't fit in the baking dish so I made a little one in a ramekin - he is so cute! If you like them iced here is a quick icing recipe. Place sugar in small bowl. Add 1/4 tsp of vanilla * then add almond milk by the teaspoon full until it is the consistency you'd like. 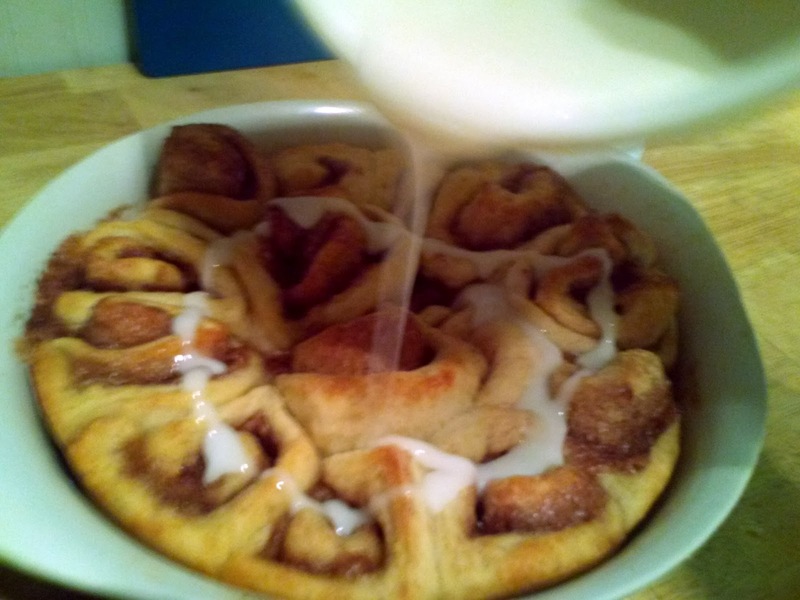 Drizzle on cinnamon rolls. 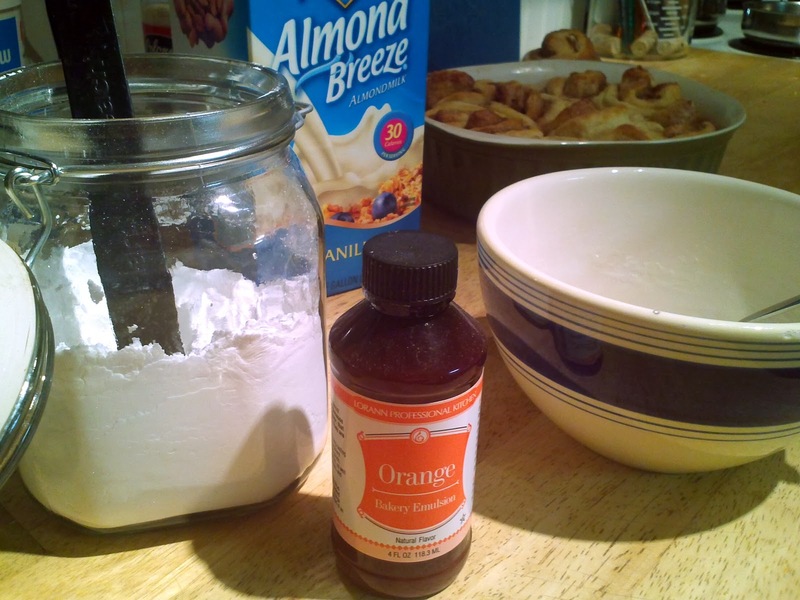 *I love using Orange Bakery Emulsion in place of vanilla. It gives it that extra oomph! I hope you enjoy this recipe as much as I do. I'd love to hear if you have good luck with it or any changes you made that were successful or not. I enjoy changing up recipes to see what happens. You'd be amazed how much you can tweak (not twerk - that's gross) recipes to cut fat and sugar/carbs but still have it look and taste exactly as it should.